Marin Carpet Care has been serving families and businesses of Marin and Sonoma Counties for over 17 years. Many of our carpet cleaning customers have referred us to friends, family and neighbors over the years. As our way of thanking our loyal customers, Marin Carpet Care is implementing a Referral Program. From this day on, customers who refer us will receive a coupon for 10% OFF THEIR NEXT CARPET STEAM CLEANING! Please be sure to tell your friends and neighbors to mention your name when booking their appointment! MCC WINTER SPECIAL! PLEASE ENJOY 10% OFF YOUR CARPET STEAM CLEANING THROUGH JANUARY 31, 2017! 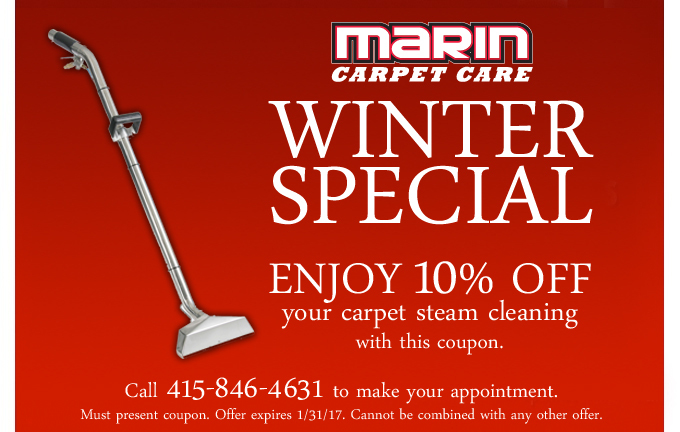 Marin Carpet Care is offering 10% OFF your next carpet steam cleaning from now through January 31st! Cannot be combined with any other offers and customer must present coupon at time of cleaning. Please download the coupon to the right of this page. 10% OFF FOR ALL CANCER SURVIVORS! Marin Carpet Care is a proud supporter of STAND UP TO CANCER. Because fighting cancer is something that particularly hits close to home for us, and for too many of our customers, Marin Carpet Care wants to celebrate those who are fighting so hard to beat this horrible disease. If you would like to learn more about this great organization and how you can make a difference, please visit www.standup2cancer.org. And to all of our fighters and survivors out there, we salute you! Please ask us about our special, 10% OFF to all cancer survivors, all year round!